In this new column, we shall talk about performing and literary arts and the print and electronic media, mainly about what happens outside pour shores. Occasionally, we may include artistic activities in the island itself as an exception to the ‘Afar’ tag. This week, for instance, we talk about Indian Cinema, to be specific films made in Tamil language. Since the different TV channels (both local and abroad) show Tamil films as well, even non-Tamil speaking people in our country with understanding or without understanding watch Tamil films and even enjoy Tamil film music. Most of the present day Sinhala audiences are familiar with the names of Mani Ratnam (a film director who makes films in Hindi as well and A R Rahman (a music director who became more famous after his winning the Oscar). But there are many others who deserve to be noticed, but they lack publicity from the manipulated media. 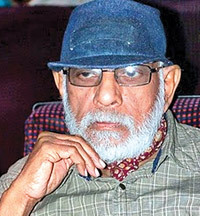 One such person is Balu Mahendra (alias Balanathan Mahendran Benedict). Perhaps most audiences here have not heard about him nor seen his films. This Lankan born artiste is one of India’s best cinematographer and an offbeat and artistic Tamil filmmaker. Strangely he is yet to make a Lankan Tamil film. He is now domiciled in Chennai. He studied cinematography at the then prestigious Pune Film Institute in India (FTII) and passed out as the best student half a century go. * Ram Kuriat ( who made “Chemmeen”, an adaptation from the famous novel by the same name (Prawns) by the doyen of Malayaalam Literature-Thakali Sivasankanpillai) who saw Balu Mahendra’s graduation short film “A View from the Fortress” invited the latter to be his cinematographer for his award winning Malayaalm film, “Nellu” (Paddy). So his first entry into the world of artistic cinema earned him honours and notice. * The first film he directed was in Kannada language called “Kokila” starring Kamal Haasan and the late Shoba. Salil Chowdry the famous music director of north India provided music for this film. Chowdry also directed music for Mahendra’s own film “Aliyaatha Kolangal” (Indelible Designs).” Kokila “won the national award. * He had been the cinematographer for five or six films in Malayaalam. * Balu Mahendra had handled the camera for the first films made by directors like Mani Ratnam, Mahendran and Bharthan. The Balu Mahendra touch is visible in director Mahendran’s “Mullum Malarum” (The Thorn and the Flower) and “Uthirip Pookkal (Withering Flowers). * Two of Balu Mahendra’s outstanding artistic films are “Veedu” (Home or House) and “Santhya Raagam” (The Last of the Sonata). “Moodu Pani” (The Encased Snow) is a halfway house between artistic and mere entertaining film. * He consciously avoid making politics oriented films. * Balu Mahendra’s erstwhile students include new filmmakers like Vetri Maaran, Bala, Ram, Suga, and Suresh who have made popular and serious films. * No one can dictate terms to an artiste. * A tragedy is that the film rolls of his two masterpieces have been destroyed. * Since he likes dark-skinned people he uses such women as his actresses. Their skin maybe honeycombed. My association with Balu Mahendra begins in 1947 when I joined St.Michael’s College in Maddakalppu as a student in the fifth standard. He was a classmate of my younger brother the late Thirukumaran. He was two years younger to me. At that time I did not move with him much. I moved to Colombo in 1953 when my father was transferred to the Colombo Kachcheri. Therefore lost touch with my friends in my Alma Mater run by American Jesuits. Suddenly in 1961 as a member of an editorial board of a little magazine called “Thane Aruvi” (The Honey Stream), he met me in Colombo to interview me. At that he was working as a draughtsman in the Survey Department. Since then we appreciate each other.